What Are the Health Benefits of Soybeans? Alfalfa is found in a variety of forms -- seeds, sprouts, leaves and extractions. It's cultivated as hay for livestock and as health food for humans. Alfalfa leaf is also an herbal remedy with numerous potential health benefits. As with any herbal supplement, before taking alfalfa, consult a health care professional to assure that it's safe and appropriate for your personal health needs. Alfalfa is also known by its scientific name, Medicago sativa, as well as the common names lucerne, buffalo herb and purple medicle. It's a member of the legume family and is native to western Asia and the eastern Mediterranean, although it now grows throughout the world. The plant has a woody stem, narrow leaves and small purple flowers. Alfalfa's above-ground parts are used medicinally. Alfalfa is a source of vitamins and minerals. According to the Memorial Sloan Kettering Cancer Center, alfalfa is thought to be a source of certain nutrients including vitamins A, B complex, C, E and K, as well as calcium, potassium, phosphorus, iron, chlorophyll and many trace minerals. Alfalfa has been used traditionally to address symptoms of menopause. In particular, it can help alleviate hot flashes and night sweats, according to the University of Michigan Health System. Alfalfa's therapeutic action may be due to its constituent phytoestrogens -- substances that are molecularly similar to estrogen. Phytoestrogens may help balance estrogen-related activities in the body, which can be beneficial in menopause. Alfalfa contains phytosterols and saponins, which help block the absorption of cholesterol into the body. In turn, alfalfa can help lower cholesterol levels in the blood and help prevent the formation of atherosclerotic plaques in the blood vessels. Atherosclerosis, or hardening of the arteries, can cause problems in the heart, lungs, brain, intestines, kidneys and limbs. 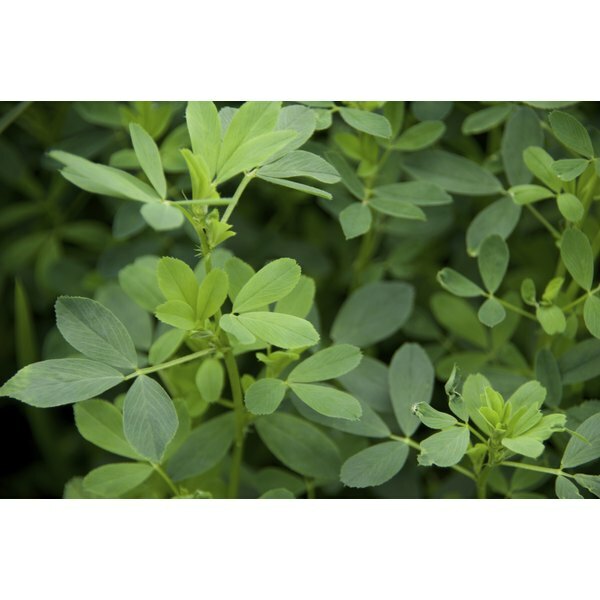 In the traditional medicine systems of China and India, alfalfa leaves are used to address digestive disorders. Similarly, eclectic physicians in the United States historically recommended alfalfa herb to alleviate indigestion, loss of appetite and poor assimilation of nutrients. Alfalfa's high nutrient content may contribute to its potential therapeutic effects on the gastrointestinal tract. Alfalfa should be avoided by individuals with lupus, hormone-sensitive cancer or gout, as well as in pregnancy. Also, alfalfa can interact with certain medications; therefore, for safety considerations, consult your doctor before taking this herb.